We are a cosy hostel on the Penthouse (4th Floor, no elevator) of a historic building, placed in the historic centre of Mexico City so everything is near. You will have quick access to all kinds of public transportation and also you can get almost to all the hot spots walking. 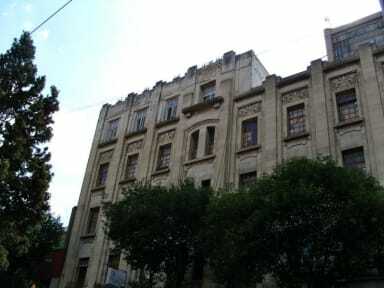 Massiosare El hostal is located in the Revillagigedo street corner with Victoria street, right in front of the Museo De La Policia. We have 2 kitchens: a big kitchen, aswell as a vegetarians only kitchen! You will love our terrace! Arrival Time: We are flexible about it, let us know! Fantastic hostel. Staff are very friendly and the atmosphere is great. The location is very central and near to supermarkets, tourist attractions and metro. The rooftop terrace is a definite bonus and the breakfast every morning was great! Awesome location, great rooftop and atmosphere. Good social areas and easy to meet people. Negatives: breakfasf runs out quick, lots of stairs to climb, and wasn't an outlet next to my bed. Would definitely stay here again. I've stayed in dozens of hostels and this is my favourite by a long-shot. The staff are extremely helpful, the breakfast is fantastic, the atmosphere is great. I came solo but this is a great hostel for meeting new friends and also a good base to explore the city. The only quibble I have is that there could be more showers and toilets, as there was a little bit of waiting at times (but it was never too much). Brilliant hostel, staff had great knowledge of things to do and about the area etc. Free water was great, views from rooftop were stunning. Loved the cats too! Very clean. Everything was great apart from the 4 flights of stairs but it was worth it for the rooftop! Amazing location, great staff, delicious breakfast. Really good place to stay, would definitely both return and recommend. Only complaints: the three-bed bunks were very high, and it would be nice to be able to have breakfast at other times than exactly 8:30. Otherwise everything was perfect!! Stay here! Good hostel. The breakfast is the best I have had in a hostel, but you need to be on time. The location is very central and close to the metro. Also, I liked the vegan restaurant in the ground floor of the building and they have a kitchen only for vegetarians and vegans. They have common areas when you can socialize and also a small party in the roof every thursday. Definitely I recommend this hostel. We had such a good time here, would highly recommend! Nice, chill but social atmosphere, very easy to meet other travellers. During our time here almost the entire hostel ended up hanging out together. Great location, close enough to the historical centre but set on a quieter street. As mentioned before, be prepared for the 4 flights of stairs. And first come first served for the free breakfast. Staff are friendly and helpful, resident cats are cute. Nice hostel with friendly staff and good facilities, the kitchen was well equipped and the bathrooms clean. Bed was good too. The included breakfast was alright, a little bit above average but you have to be there in time to get your share. Only downer were the stairs especially with a lot of luggage. Rooftop terrace was very nice. Good vibe and easy to meet new people. Close to the historic part of town. I had a really nice stay here. The stairs really helped to improve my fitness. Nice atmosphere in general. One of the worst hostel experience I've had. I booked 2 nights but only stayed 1. The room was full of mosquitos so I barely slept, the cleanliness is bad, the room was next to the hall and reception so it was very noisy, there was not atmosphere, the area is close to main streets but the neighborhood looks bad at night (lot of homeless), there was no breakfast. When I told the staff that I was leaving early they did not care about the reasons. I don't understand why this place is so overrated.